I think for a long time people wondered why IKEA only offered a wire shelf lazy susan for the corner base cabinet. Well, they have finally listened to all us IKEA crazy people and introduced a new version of the lazy susan. I thankfully hadn't installed my lazy susan yet because my daughter loved to hang out in that cabinet. When I saw a preview of the new catalog, I noticed the new lazy susan. So I brought mine back and got the new one. Easy to assemble. Use the template they provide to screw in the bottom and top piece. I had to use build-up strip for the top piece to be straight and level (see pic below). Then you load in the wire pieces and the two shelves. Install the two part pole in the middle. Slide the top part of the pole up so it fits into that top piece and screw them in place. Then stick the metal pins under the two shelves to set them at whatever level you want them at. Finally, stick in the clips (be gentle, I broke the first one and they don't give you extras) and click in the wire. After it was all said and done, I don't see why I couldn't have put the clips and wire in before placing the shelves inside. But it didn't make a huge difference either way. But, wait! Houston, we have a problem. 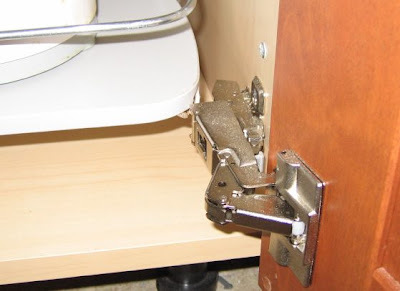 The hinge for the corner cabinet door crashes into the corner of the bottom shelf. Argh! How did they not notice this happening? It took me so long to adjust that hinge for the door to be perfectly level and flush, I'm not going to move it. If there's a solution to this problem, I haven't figured it out yet. It's always something isn't it? Well, I still like it better than the wire shelf version. They spin nicely and seem super sturdy. I checked the thing at my ikea, and it appears you have the lady susan mounted the wrong way somehow. the shelf should coast above the hinge. Thanks Amaury..that was an obvious solution! yeeesh. They do have pegs to set the shelf height, so I guess I could've set the bottom shelf higher...but why would you want a big space under that shelf? It's already 2 1/2" high...if I moved it up a peg the space would easily be 4" and I couldn't imagine what I'd do with that space! I think, when I have some spare time haha, I'm going to find something like those baby corner protector things to put on the shelf to keep it from getting worse. I disagree with the comment that Amaury posted. 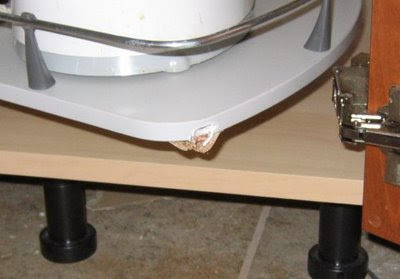 I have the exact same problem with my lazy susan and it's definitely a design flaw. Everything is assembled just fine and the lazy susan catches on the hinge of the door. The only solution I've though of so far is drilling another hole a couple inches above the current hole in the post. But as you mentioned, you're going to lose valuable cupboard space by doing this. 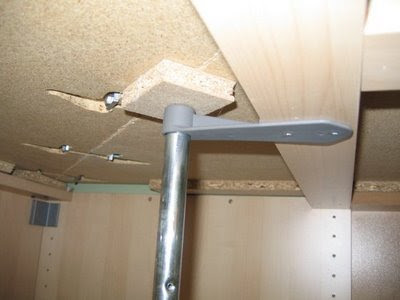 I had the same problem except the hinge/shelf collision forced my cabinet apart at the bottom the moment I first closed the doors with a loud scrunch. The simplest fix is to take everything out and move the bottom bar holder bracket back toward the far corner a good 1/4". You should do this with the template or if not keep the pin notch in the same relative position so the shelf will come to auto-rest correctly. You could move it back more but you don't want to have the bar too out of alignment with the top bar holder unless you want to move that one too. There is plenty of room on the back side of the shelves so I don't know why they made it so tight at the front. Hi, I'm installing a new IKEA kitchen and am wondering what you think of the lazy susan in the corner cabinet that you showed in this post. It seems kind of flimsy to me and I would like to be able to put a lot of stuff on it. I was thinking of trying to build a shelf halfway up and install a wooden "super susan" on casters that would be stronger and more stable. What has your experience been like with this one? It's funny that you left this comment since just yesterday I was wondering if I had too much stuff piled on top of the lazy susan...juiceman jr, my big heavy paella pots, crockpot, food processor, veg-o-matic, henrietta hen, meat grinder...the list goes on but I can't remember what else is in there lol. This lazy susan is surprisingly strong so I wouldn't be worried about it. And for anyone who cares, the part of the shelf that was getting banged up hasn't gotten any worse and I haven't done anything about it yet. I have just installed this and the hinge does not impede the bottom shelf. I wonder if you printed the template for the screw holes on letter paper as the pdf is meant for Euro A4 size. Printing on letter would skew the placement for the screw holes somewhat. 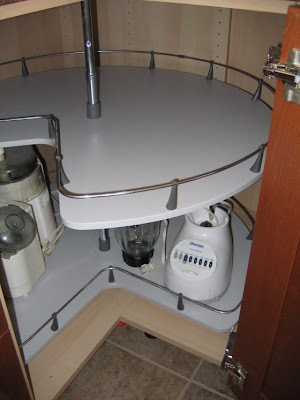 I had my lazy susan installed professionally however the top shelf doesn't auto-rest at the door but rather at the back of the cabinet - 180 degree off... any suggestions? I'd say, if you paid someone to do it for you, then it becomes their responsibility to make sure everything works right. Call them and have them figure it out! Good luck!